A Vision for Mission - New Opportunities and New Partnerships! In 2009, the United Anglican Church Province II developed a partnership with World Wide Missions Cameroon to help in organization, growth and multiplication of the churches in Cameroon. Missionary Bishop, Michael Jarrett was given responsibly for this endeavor and is currently seeing much fruit from this partnership. 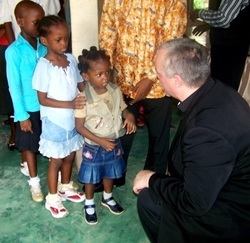 In February 2010, Bishop Michael Jarrett visited the main church of the Free Presbyterian Churches of Cameroon, where elders and parishioners from many of their churches had gathered. Rt Rev Jarrett was invited to minister and share the United Anglican Church's vision of reaching a lost & hurting world with the Gospel. The Free Presbyterian Church presented Bishop Jarrett with a letter of thanksgiving and a letter extending friendship and inviting the UACII to consider the Free Presbyterian Church as a sister Church. January of 2011, The United Anglican Church Province II signed a concordat and welcomed The Free Presbyterian Church of Cameroon into communion and fellowship. In 2010, Bishop Michael Jarrett was invited to speak at the nationwide conference of the World WIde Missions Church in the country of Liberia. While there, he met with leaders of the mission and discussed future plans for partnership. One of the main areas of discussion was a future work among the deaf of Liberia. Beginning in the fall of 2011, the United Anglican Church Province II and World Wide Missions Liberia will partner to reach the deaf in Liberia. We rejoice in this partnership and look forward to what the Lord will do in this new opportunity. In 2008, the United Anglican Church Province II has developed an affiliation with Good News Churches of Ukraine (a local Ukrainian fellowship with over one hundred churches). During the many missions trips made to Ukraine by Archbishop Larkin and Bishop Jarrett over the last few years, a true friendship between Good News and UAC has developed into a partnership. Partnering with Good News Churches of Ukraine, our goal is to open a new United Anglican Church in Ukraine sometime during the year 2011 or 2012. We hope this to be one of many churches UAC will plant in Ukraine and the former Soviet Union. Using our printing ministry we will share the UAC vision of reaching all nations with the Gospel of Christ. We also will be able to print prayer books, evangelism material, and possibly a quarterly United Anglican Church magazine in Russian.